The Shingletown Medical Center (SMC) would like to share this information to help those that may be dealing with high cholesterol. The American Heart Association advises reducing saturated fat intake to no more than 5 to 6 percent of the total daily calories. To do this, they suggest limiting the following foods: fatty beef, lamb, pork, poultry with skin, lard and shortening, dairy products made from whole or reduced-fat milk, saturated vegetable oils, such as coconut oil, palm oil, and palm kernel oil. It is also important to avoid trans fats. Foods to stay away from include: packaged cookies, cakes, doughnuts, and pastries, potato chips and crackers, packaged frosting, fried foods, bakery goods that contain shortening, buttered popcorn, any products that contain partially hydrogenated or hydrogenated vegetable oils. Only animal products contain cholesterol itself, as a liver is needed for its production. Cholesterol that has been swallowed is poorly absorbed into the bloodstream and has little effect on cholesterol levels after several hours. Some of this cholesterol, however, may be absorbed and reach the arteries, so limiting high-cholesterol foods may be beneficial. Foods that contain cholesterol and may be best avoided include: red meat, sausage, bacon, organ meats, such as kidney and liver. Fiber is equally important for a healthy heart. Fiber is found in two main forms – soluble and insoluble. Insoluble fiber is important for digestive health. Soluble fiber binds to cholesterol in the bloodstream and helps remove it through stool. 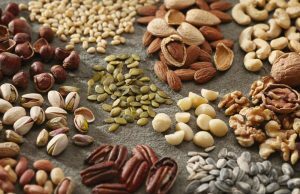 Some cholesterol-friendly, fiber options to consider include: fatty fish, such as salmon, trout, albacore tuna, and sardines, nuts, seeds, and legumes, the skins of fruit, non-tropical natural vegetable oils, such as olive oil, avocado oil, canola oil, and safflower oil, oats and oat bran, chia and ground flaxseeds, beans, barley, psyllium, oranges, blueberries, and Brussels sprouts. Combining these cholesterol-cutting techniques with a balanced, plant-heavy diet and an exercise routine, can reduce the risk of heart disease, and will also promote an overall healthier life.